There is a restaurant chain called Nando’s here in Australia. They basically specialise in roasted chicken which closely resembles the taste of home’s Lechong Manok. You can even order plain steamed rice in some of their franchises, too. No wonder it seems very popular with Filipinos living here. It was one of our favourite places to eat, too. However, several days ago, we ate lunch at Nando’s at Melbourne Central. We ordered a quarter chicken meal (with rice and 390ml Diet Coke), a BBQ chicken thigh meal (with rice and 390ml Diet Coke again), and one extra side dish (2 pieces of corn on the cob) for a total of $26.85. As you can see, it is a bit expensive to eat out. And this was a non-fancy restaurant. Anyway, I paid for the meal with my credit card and thought nothing more of it afterwards. That was, until we got our credit card statement. 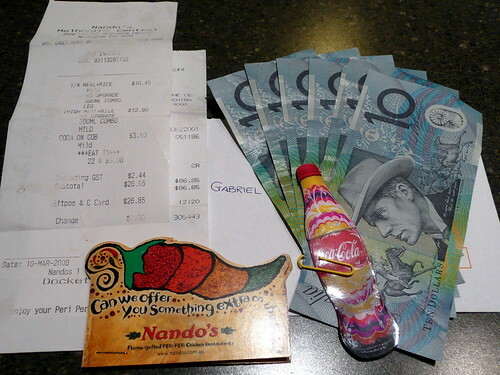 Supposedly, we were charged $86.85 by Nando’s on the day we ate there. We couldn’t believe it. That’s a $60 difference! (Converted, that’s about 2,300 Pesos!) At the time, I didn’t have the receipt on hand so I couldn’t be one-hundred percent sure how much our meal was but I was very sure it wasn’t over 80 bucks! I rang up our credit card’s bank to dispute the erroneous charge. I explained the situation to the customer support person over the phone. He told me that he could easily mark the charge as being disputed. It would cost me an additional $10 to do this, he said. Then, the bank will bring the matter up with Nando’s. If Nando’s could prove that the charge was all in order, then I wouldn’t get my $60 back and I would’ve lost $10 more for the attempted dispute. I would end up losing $70 instead of just $60! Of course, if Nando’s agreed that they were in the wrong, then I’d get my $60 back but I would’ve still lost the $10 for the dispute fee. I wasn’t sure if I had thrown away the original receipt so I was afraid to proceed with the dispute. What if Nando’s said that I signed the credit card docket that had $86.85 on it? There was no way for me to contest that claim. So, I told the bank guy that I’d first look for the receipt and call back when we have it. Raquel and I looked all over the house desperately hoping that the receipt was just stashed somewhere and not in a rubbish bin somewhere in the city. Luckily, Raquel found the receipt just on top of our coffee table. In fact, there were two receipts. There usually is when you pay by credit card. One is the official receipt that comes out of the cash register and another receipt that comes out of the credit card device (that also prints out a docket for the owner of the credit card to sign on). The Nando’s receipt said we paid $26.85 for the meal. However, the credit card receipt said that I paid for $86.85! It’s basically a carbon copy of the receipt that I signed. I couldn’t believe that the amount on the cash register wasn’t the same as the amount on the credit card device. I thought those two devices were linked electronically! Now we know better. Apparently, the cashier had to type in the amount twice and unluckily for us, she typed the amount in the credit card device incorrectly by pressing 8 instead of 2, 86.85 instead of 26.85. With this in mind, Raquel and I decided that disputing this with the bank wouldn’t be such a good idea. Nando’s could always claim that I did sign for the $86.85 charge, and they would be right. In the end, we might have a better chance of getting our money back if we disputed this with the actual branch of Nando’s at Melbourne Central. Luckily, we work in the city so we could just easily go there during our lunch break. One day during our lunch break, I went to the Nando’s where we ate. Nearing the place, I tried to muster up some anger so that I could visibly show my great displeasure to the manager while I explained to him our problem. In the end, I’m not that type of guy. I ended up explaining the matter with the manager very calmly. I fully expected him to immediately refund the difference to my credit card right then and there. Instead, he photocopied my receipts and told me that he would consult their video footage to prove my claim. I couldn’t believe it (for the nth time!). But since I was in a rush to get back to my office, I just asked how long should I wait for a resolution. He told me that he would call me. I went back to work not at all hopefull for a quick resolution. In fact, I was pretty sure I would have to call back the manager after one week just to follow up on my complaint. My officemates at work couldn’t believe the situation, too. Consult their video? How would that help? Did they take a photo of me so they could make a match? Why didn’t they just refund the money directly back to my credit card? It was the same credit card as on the receipt? One of them even suggested I raise the issue to Nando’s ombudsman (apparently, each company has one). However, near the end of business hours of the same day, the Nando’s manager called. He told me how very sorry he was for all the inconvenience and told me that I could pick up the $60 at the store that afternoon. I was pleasantly surprised at how fast they looked into our problem. And not only would I get a refund, but I would get it in cash (as opposed to debitting the difference to my credit card). When we got to Nando’s, the supervisor (the Manager went home for the day) profusely apologised to us for the inconvenience and handed us an envelope. Inside the envelope was the $60 in cash along with a few vouchers to upsize our side dishes and/or drinks plus a fridge magnet. That was nice of them. Is it hard to apply for a working visa there in australia? mkapunta jan.. Hope you can help me..
ano kaya ang nakita nila sa video haha. good to know that you got the $60 back.